I’m really starting to like snow. It’s even better when you can walk on top of it to places you otherwise wouldn’t get to see this time of year. 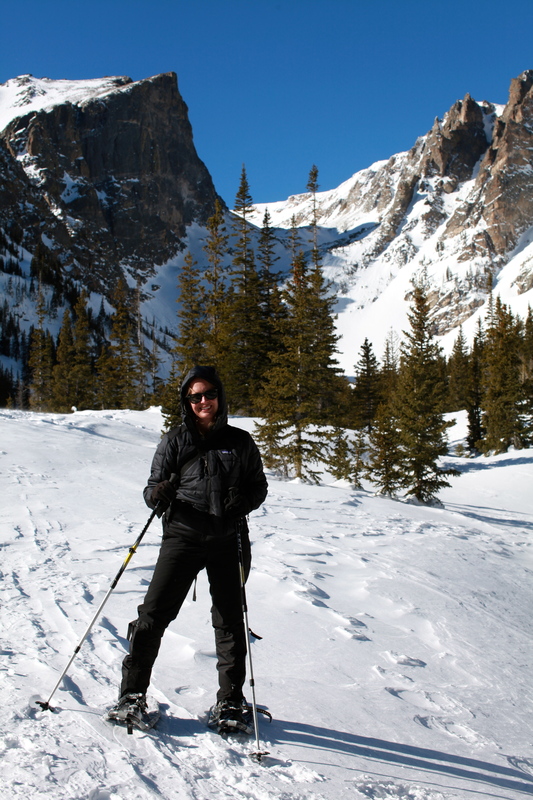 Today I went snowshoeing for the first time with my friend Katie and a great guide, Jared with Yellow Wood Guiding. He was not only helpful with teaching us snowshoeing, but had lots to share about what we were seeing and even showed me how to use my fancy camera I haven’t taken the time to learn yet. We went on a 3 1/2 hour trek in the Rocky Mountain National Park near Estes Park. As you’ll see from the pictures it couldn’t have been a more beautiful day. I live at 5,000 feet in Boulder and I could still feel the transition to going up to 9,500 feet. I definitely felt a little out of breath at times, but the good thing about snowshoeing is that you can take lots of breaks and just marvel at the scenery. The snow had been on the ground for awhile so you could see lots of animal tracks from little mice to snow hares & deer. There was a pretty well established track, so getting up wasn’t bad. 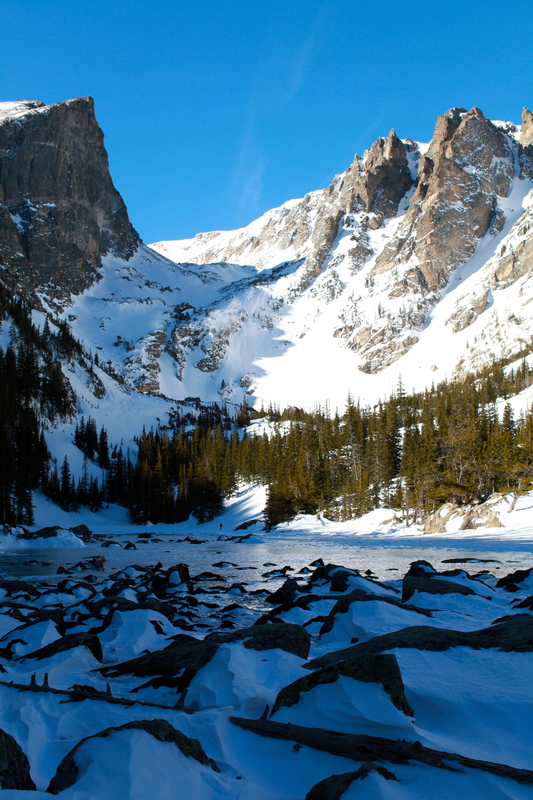 We snowshoed to a gorgeous lake called Dream Lake. Yes, the sky is really this blue. I’ve never seen anything like it. Against the snow it’s a pretty incredible contrast. It was about 45 degrees out today and I was actually warm snowshoeing. My favorite part was coming back down. 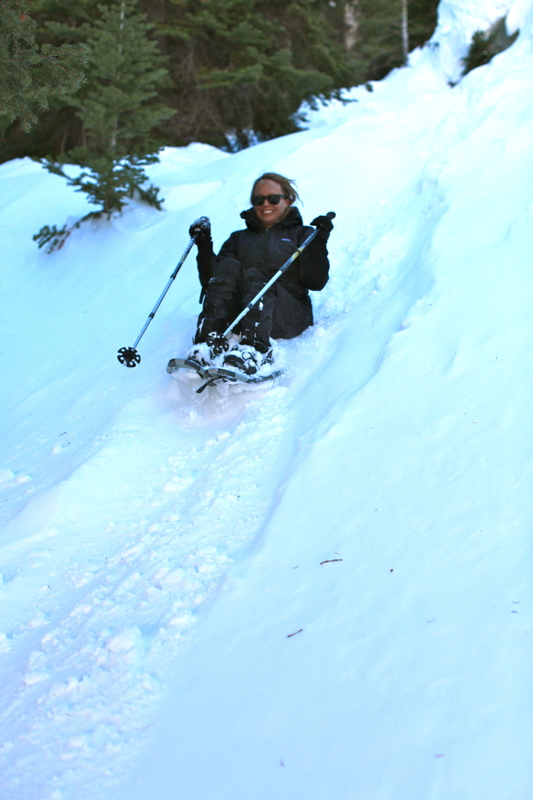 We went off the track into the forest and I got to enjoy the fun of sliding. The thing I’ve come to love about snow this week is that it can make you feel like a kid again. I had so much fun sliding down the various hills. It’s going to be hard to decide which winter activity I enjoyed the most this week. I’m definitely starting to feel it in my legs! In terms of sheer beauty, snowshoeing was such an incredible experience. I would never have been able to see what I saw today had I not given it a shot. I can’t believe I live here. You are my kind of lady! I love snow-shoeing too. My mom bought Steve and I snowshoes last year for Xmas. We just went up near Mt. Adams in Washington. It was glorious. We need to make a snow-shoeing date! i would love to have a snowshoeing date! someone was telling me about a glacier out here that is fun to snowshoe on. wow! what a life! so many new adventures! i love it. 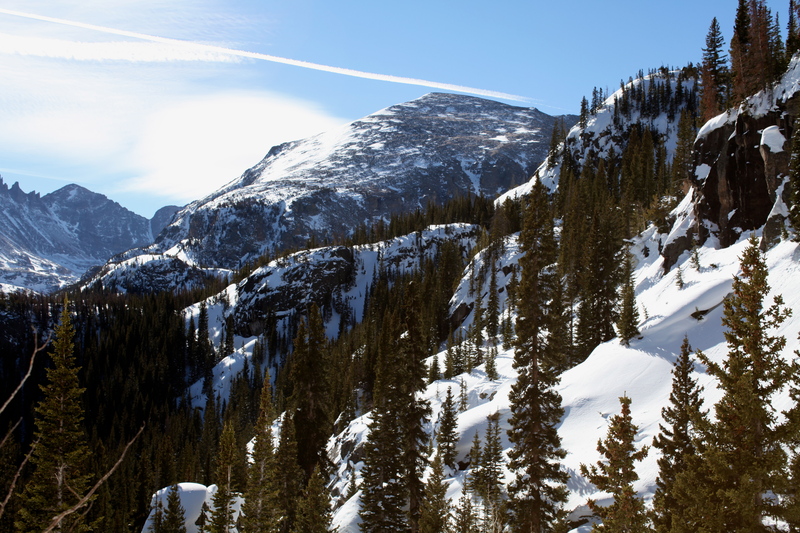 You are currently reading Snowshoeing at 9,500 feet at 52 To Do.